I took a side trip to Mount Oriel as I headed up to the Cooley peninsula yesterday. I followed paulocon’s directions and turned at the Campus garage in the village of Collon. 2 miles up this road brings you to the service lane (N977 831 A) which heads up to the top of the hill. I was able to drive up the service lane to the gate which leads out onto the summit field. The summit is a grassy field with six masts and service buildings around its perimeter. In the field were frolicking lambs, and several large deciduous trees dot the landscape. 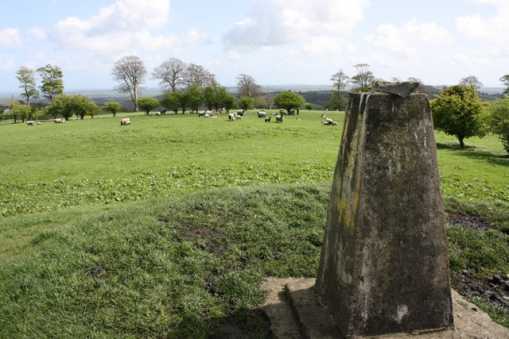 The trig pillar (N981 832 B) is atop a large barrow, with another smaller barrow next to it. Because Mount Oriel is relatively isolated there are expansive views across the plains to the south and east. Views to the north were somewhat restricted by some trees and communications towers at the edge of the field. If you can ignore the encroaching forest of masts the summit is actually a nice place with a peaceful feeling to it.